Web applications are the number one threat vector for data breaches, and securing them properly is a priority. Traditional security solutions emphasize protecting the perimeter of corporate networks. While this approach can work, it is often the cause of performance chokepoints and is ineffective at protecting from attacks against web applications. 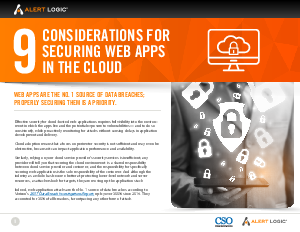 Read the eBook - ‘9 Considerations For Securing Web Apps In The Cloud’, that outlines the best practices for securing your web applications on the cloud, so you can confidently deploy even your most sensitive workloads on AWS to take advantage of its scalability, cost-effectiveness, and broad and deep selection of cloud services.